In The Second Amendment: A Biography, Michael Waldman, President of the Brennan Center for Justice at NYU School of Law, provides a detailed yet highly accessible examination of the Second Amendment. Rather than becoming bogged down in parsing the precise wording of the Amendment, he provides a much broader and illuminating history of how the Amendment has evolved through time. Waldman’s book is an invaluable guide to navigating claims made about the Second Amendment and the historical roots of our current national debate over guns. Waldman begins with the Revolutionary War, the crucible that formed both our country and later the Constitution. 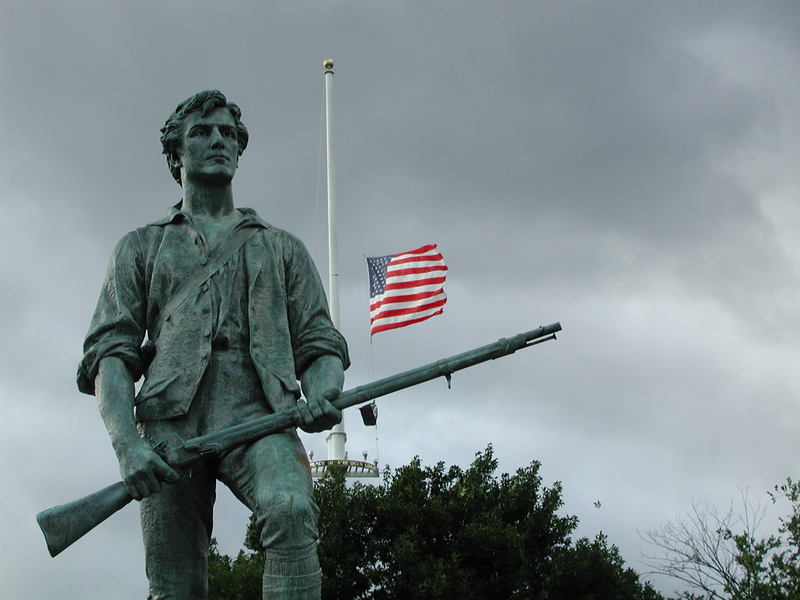 With the success of militia units at Lexington and Concord as well as during the siege of Boston, citizen soldiers seemed more than a match for the well trained professionals they faced. This illusion swiftly evaporated. The disastrous Battle of Brooklyn and other defeats combined with mass desertions and a general lack of discipline convinced even the fiercest defenders of militias to admit that relying on them for defense was foolish. Yet among the general public, militias remained very popular. By the end of the war, Congress was faced with the difficult task of paying homage to the militia system while creating an effective defensive force to maintain security. Shays’ rebellion further highlighted the need for an effective military force and served as a catalyst for the Constitutional Convention. While today we see the Bill of Rights as a vital part of the Constitution and treat it with gospel-like reverence, when the amendments were originally proposed it was met with a yawn and shrug by both federalists and anti-federalists. This general lack of interest at the time has resulted in the large amount of contention surrounding the original intention of the Second Amendment. The few discussions surrounding the right to bear arms during the Constitutional debate revolved around State versus Federal control of the militia. Most of the quotes that appear to make clear statements about the individual right to bear arms are either completely fabricated or wildly removed from context. Between 1888 and 1960, every single law review article written on the Second Amendment rejected an individual rights interpretation. The 1934 National Firearms Act and subsequent Supreme Court Case US v. Miller were exemplars of this legal consensus. During the debate over the bill, the president of the NRA (National Rifle Association) explicitly stated that he had not given any thought over whether the bill violated the constitution and later wrote that the right to personal firearms could not be found in the Constitution. By the 1960s, the old militia system was long dead and the Second Amendment itself was an archaic relic irrelevant to modern society. This would quickly change. In 1977, the NRA underwent a massive upheaval (referred to as the Revolt in Cincinnati) as it tried to retreat further from national politics. Infuriated by the NRA’s timidity, the most extreme element of the NRA threw the old leadership out and installed firebrands from other gun activist organizations Whereas the old NRA had largely focused on hunting and didn’t overtly attempt to block gun regulation, the new regime was an entirely different animal. The right to bear arms became sacrosanct, and the interests of hunters became secondary. Around the same time of the Cincinnati Revolt of 1977, Second Amendment scholarship also underwent a dramatic shift. From 1970 to 1989, more than 27 law review articles were written supporting the individual rights interpretation, versus only 25 for the collective/civic view. More than half of these articles were written by a handful of lawyers employed by the NRA or various other pro-gun groups. This shift in legal scholarship and pro-gun lobbying coincided with an almost equally dramatic rise of conservative justices in federal courts. The stage was set for a legal showdown. DC v. Heller represented the climax of the battle between the old collective consensus backed by more than a century of legal precedent and a significant majority of historians, and the new individual rights view bolstered by a wave of recent scholarship and public support. And while the individualistic interpretation proved victorious, the expected fall of numerous firearms laws across the country failed to materialize. Since the case, the vast majority of gun regulations across the US, including assault weapons bans, have been upheld as constitutional. The central message of Waldman’s book though is not whether the founders saw the Second Amendment as a collective, civic, or individual right. Even asking this question of the founders’ intentions belies a misunderstanding of that time period. Rather, Waldman‘s history demonstrates that the Second Amendment has evolved dramatically over time. This evolution has been borne out of necessity in order to counter new threats to public wellbeing. Taking the founders’ words as gospel merely serves as a dangerous excuse to dodge critical public safety questions. Indeed, Justice Scalia’s crowning triumph of originalism, when seen in historical context, in fact represents the opposite of what he professes. DC v. Heller was not the product of unprecedented historical analysis uncovering long lost truths, but was rather the culmination of a decades long political and social movement. However, Waldman emphasizes, trying to counter orginalism with originalism, while tempting, is ultimately a siren’s call. Whether we want it to be or not, the Constitution is living, and the Second Amendment is no exception. We should embrace our living Constitution and the flexibility it provides to solve the tragic problem of gun violence.